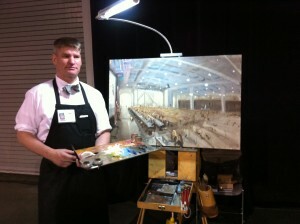 Ever heard of a live wedding painter? We haven’t either until we met Sam Day at the Wedding MBA in Las Vegas last month. Sam will setup his canvas at your wedding and paint it. That’s right he paints weddings. Can you imagine instead of having a picture of your wedding on your wall, you can have an incredible piece of painted art hanging there instead. Very unique idea. Sam is a rare find as their are currently very few wedding painters in the world. His paintings are something we never would’ve expected to see at a wedding. Check out his site here to see his work.